Womens Robes - From cosy warm fleece robes and chenille robes to beautiful satin robes and luxurious long robes, every woman needs more than one robe for their favorite nightgowns, chemises, pajamas, and sleepwear. Whether you’re taking stock of your lingerie drawer or looking for a new everyday favorite, these womens robes are the perfect finishing touches to an amazing array of intimate apparel styles. Follow along as we take a closer look at some of the best luxury robes and insider secrets that you need to know about this popular ladies sleepwear style. Chenille Robes - are they the new must-have? Start here for learning the ins and outs, and finding out everything you need to know so you can educate yourself and slip into the sleep wear of your dreams. The Perfect Hooded Robe - Soft, snuggly, and probably the most comfortable piece you’ll own, the hooded robe is a must-have for any woman who loves relaxing bubble baths or showers. Follow these easy tips to find the perfect style. Sweet And Sassy Short Robes - Learn how to rock a sensational short robe like a supermodel when you steer clear of these no nos and follow the must-know rules. Make it your new favorite. Popular Plus Size Robes - Curvy ladies who crave style, listen in – we’re sharing the basics and essential info for finding the perfect robe for your shape. How to score one that fits you perfectly. Part of the enjoyment when it comes to sleepwear and lingerie is in the gorgeous materials – from silky satins to fluffy cottons, we’re sharing all of the fabulous fabrics that you need in your collection. Chenille Robe - super soft and warm, this amazing night wear favorite features a silky smooth and cozy texture that's not too heavy - perfect for cuddling up and watching Netflix on cold winter nights. From its luxurious feel to its easy care, discover why creamy chenille is our ultimate plush wear choice. Learn why we love it. Satin Robes - Nothing is more glamorous than a sensational satin robe and we’re making it ultra easy to wear one with these 5 top tips and tricks. Fall in love with luxury satin. Fleece Robes - Treat yourself to the crème de la crème of warm and cosy fleece robes with our ranking of the finest brands in the world. Take your pick from styles from around the globe. Look and feel your very best in any style of robe when you know your body type and the cuts that suit your shape. Cut a flawless figure with these must-know tips for flattering your frame. Robes For Women - No matter your size, we’ve got you covered with this guide to the hottest wraps of the season. Celebrate your curves. The Short Robe - The most versatile style; clear out closet clutter and pare your sleepwear collection down to the exciting essentials. Learn why this popular style is an everyday fundamental. Women’s Robe - Have a little fun with beautiful lingerie and intimate apparel, and step outside the box of traditional styles. Try these new and exciting sleepwear favorites. A flannel, velour or chenille robe are thick, plush, and perfect for cozy evenings while binge-watching your Netflix favorites. Turn any day into a retreat to a luxury spa or hotel when you slip into one of these high end robes that will leave you feeling posh and pampered. Here are our top picks for the chicest robes in the world. 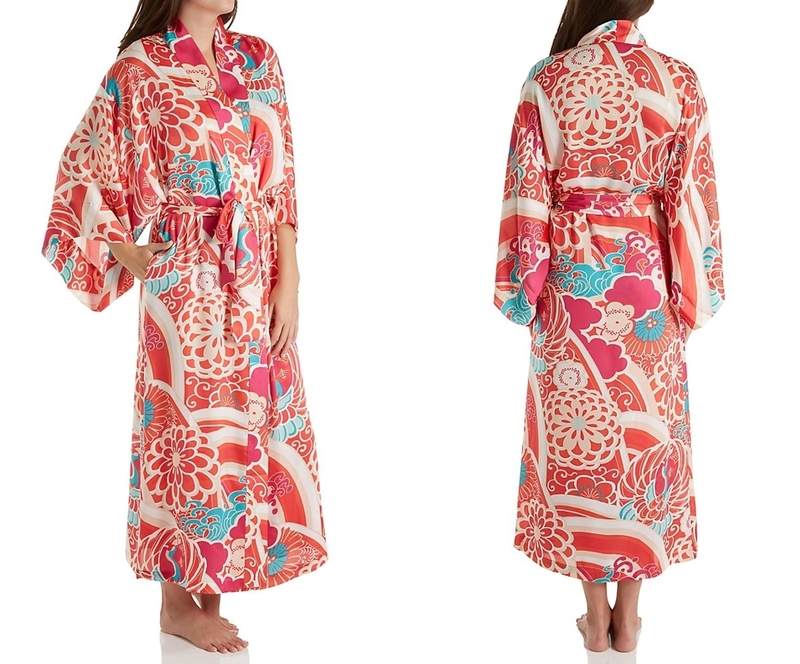 Kimono Robe - Show off your exquisite tastes in a statement-making kimono robe. You’ll fall hard and fast for this opulent style that makes any evening feel like an extra special indulgence. How to make an entrance. 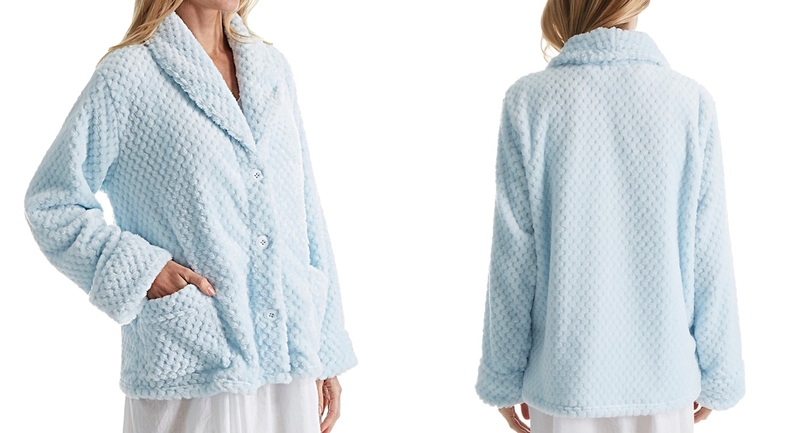 Chenille Robes - when it comes to warm and cozy robes for sale, it's no secret that fleece, velour, and cashmere are all great luxury choices - though a bit on the expensive side. Super soft and fuzzy Chenille is an excellent alternative that offers the ultimate in warmth and affordable comfort. Check out why it's the new must-have. Long Robes - Take your pick of amazing long robes from our list of who’s who of sleepwear designers - we’ve rounded up the chicest styles from the poshest brands. The Best Designers. Ladies Robes - Shopping for a beautiful new chemise, nightgown, pajamas, or sleepwear? Once you've decided on your soon-to-be new favorite, consider this - wouldn't it be thrilling if you didn't have to pay full price, without compromising on style or quality? Follow these insider tips for shopping smart. Here's how to save.